Free shipping to most metro locations! Includes 1 pair of 2 metre premade speaker cables with 4mm banana plug connectors. Made with 17AWG oxygen free copper. All of our products include 12 month warranty. Your items also come with statutory warranty which cannot be excluded under Australian Consumer Law. All faulty items must be returned to us for inspection / repair. Voll will cover the return shipping costs at our discretion. 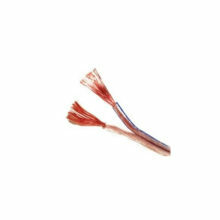 This speaker cable is perfect for Voll B44 speakers driven at full power. Sold per metre – to buy 3m add 3 units to cart. Please note: Product may vary in appearance from picture. 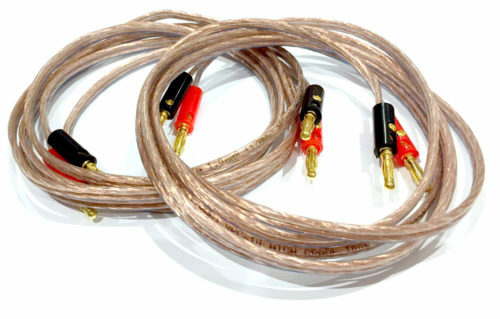 Please note: Due to shipping costs this speaker cable can only be ordered with the purchase of speakers or amplifiers. Any orders containing just speaker wire will be cancelled. 3.5mm to 3.5mm 150cm (1.5m) long stereo aux cable. Flat ribbon cable design. High quality gold plated plugs. 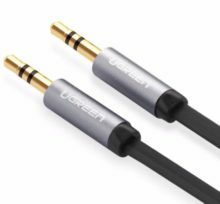 Ugreen is a manufacturer of good value, high quality audio cables. Gold plated 4mm banana plugs . 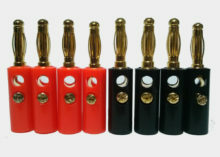 8 plugs included (4x red and 4x black). 3.5mm to 3.5mm 50cm (0.5m) long stereo aux cable. Flat ribbon cable design. High quality gold plated plugs. Established in 2014, Voll is an importer of great value speakers and amplifiers. Our mission is to deliver great quality products at an affordable price while maintaining exceptional levels of customer satisfaction.